Criticisms of arms sales by western countries are invariably met with the response that governments exercise extreme care when approving the export of arms, applying rigorous criteria on human rights, conflict, and international law. So what could possibly go wrong? [Video: 2.30 mins. Vijay Prashad, journalist, historian and director of Tricontinental Institute for Social Research, discusses the flow of weapons from ‘friends’ to ‘enemies’ across today’s war zones. Produced by World Peace Foundation with Corruption Watch, original footage produced for Shadow World]. Plenty. For one thing, friends can prove to be highly unreliable allies, or worse, easily turn into future enemies. There is no better example of this than Iraq, to whom the US supplied large quantities of arms in the 1980s, including, most shockingly, agents for chemical and biological weapons. Secondly, diversion of arms from their intended recipient is a common problem. Arms dealers can easily fake end-user certificates so that weapons supposedly destined for a ‘legitimate’ state recipient are diverted to a war zone. Or states may re-export arms against the wishes of the original seller. When states collapse, such as Somalia in 1991 or Libya in 2011 (see below), there can be a huge outflow of arms to neighbouring countries. Thirdly, arms may be used in ways not intended by the seller – although they should often have been foreseen. French and other European arms supplies to Rwanda during the early 1990s played a key role in facilitating the 1994 genocide. Fourthly, don’t say it too loudly, but western states aren’t always quite as fastidious in their concern for how their arms will be used as they make out, especially in situations concerning broader strategic interests or the fortunes of key national arms producers The US and UK happily supplied arms to the Indonesian dictator Suharto even as he was using them to commit mass atrocities in East Timor. When the US treated Saddam Hussein as a useful ally and supplied Iraq with arms, they were under no illusion as to the regime’s human rights record, or the human toll of the Iran-Iraq war. The UK is currently turning a blind eye to the use of its weapons by Saudi Arabia to target civilians in Yemen, and continuing to supply the Kingdom unabated. What of the Arms Trade Treaty, signed in 2013 by over a hundred nations, intending to control the conditions under which arms are exported? It is a significant step to have an international treaty on the arms trade for the first time, but the criteria it applies for states to allow arms sales are lax and full of loopholes and carry no enforcement mechanism . In many cases, they are weaker than the criteria supposedly followed by national export legislation. Secondly, the Treaty does not cover all weapons, and third it does not include all types of arms transfer, such as loans, military aid, and weapons supplied under government-government defence cooperation agreements. It is unlikely that the ATT will stop a single significant arms deal by the major producers that would have gone ahead without it. The depressing story of Western arms sold to a fallen dictator spreading to dangerous militants was repeated in Libya. After seizing power in 1969, he refused to build government institutions, and dismantled all structures that existed. 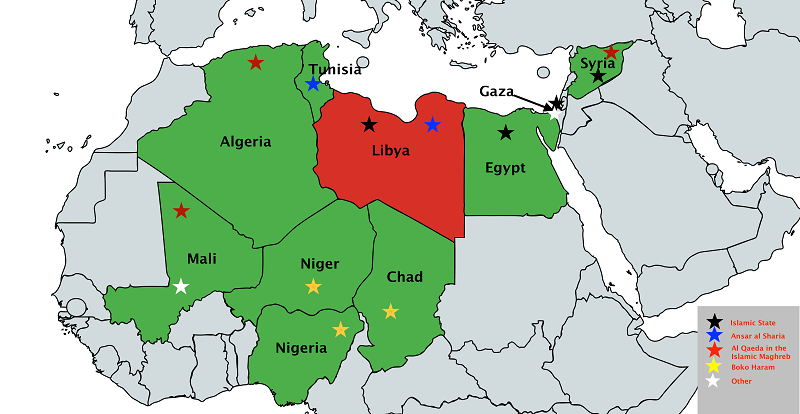 With major regional ambitions, Gaddafi also spread weapons and instability throughout the Middle East and Africa. He invaded Chad, supported Arab supremacists in Darfur, and indiscriminately funded groups such as the Revolutionary United Front in Sierra Leone and forces loyal to the war criminal Charles Taylor in Liberia. To do so, Gaddafi relied on massive arms imports, funded by oil exports. Between 1970 and 2009, Gaddafi imported weapons that were equivalent to $30 billion. Of this, 73% was from the USSR, followed by 10.7% from France and 4.7% from Germany. Libya’s army never recovered, but Gaddafi’s appetite for buying huge quantities of weapons was unquenched. Following Libya’s rapprochement with the international community in 2003, and the lifting of UN, US and EU arms embargoes in 2003 and 2004, he found many ready sellers. SIPRI noted in its 2010 Yearbook that, ‘the heads of the governments of France, Italy, Russia and the UK have visited Libyan leader Muammar Qadhafi in recent years, accompanied by arms company representatives and rumors of multi-billion dollar arms deals.’ Not all of this led to actual orders, but Russia agreed to a $1.8 billion deal to supply tanks, fighter jets, and air defense networks, and EU countries granted at least €834 million in arms export licenses between 2005 and 2009. The biggest issuers of licenses were Italy (€276 m.), France (€210 m.), and the UK (€119 m.). So many weapons were purchased under Gaddafi’s rule that it was almost impossible that the Libyan military could use them all. Military expert Anthony Cordesman reported that Libya’s imports vastly exceeded its ability to organize, man, train and support its forces. The imports reached farcical levels, and involved vast amounts of waste on equipment that could never be crewed and operated’. Many of its air craft and tanks were left in storage. Gaddafi’s arms buying spree was partly motivated by his belief that he could build an Islamic Legion of 1 million troops. The Legion never materialized, but the fighters drawn from neighbouring countries as its putative core went on to lead rebellions in west Africa and organize militias in Darfur and Mali, among other places. In 2011, Muammar Gadaffi was overthrown by an insurrection, backed by Arab governments such as Qatar and Sudan, with a NATO air campaign paving the way. His overthrow was presaged by the mass looting of Libyan stockpiles in areas that the government couldn’t control; and as revolutionaries and mercenaries captured more territory, more stockpiles were looted. Since then, the situation in Libya has deteriorated rapidly, with multiple governments and armed factions competing for control of parts of the country and its oilfields. The approval by the UN of a new Government of National Accord in December 2015 did not help matters, as the new body failed to gain the support of many of the other political and military actors. With thousands continuing to be killed every year, Libya has become a failed state. When the African Union debated its position on the uprising and civil war in Libya in March 2011, the Chadian President Idriss Deby warned against ’opening the Libyan Pandora’s box’. He was prescient. The arms that Gaddafi had stockpiled have spread widely on the continent, fuelling further regional instability, both in the chaos before and virtual anarchy after his overthrow. In Mali, Tuareg rebels, once employed by Gaddafi as mercenaries, took over large swathes of the country after looting Libyan armories. Subsequently, Islamist fighters attempted to overrun the entire country, prompting an African and French military intervention. France was thus fighting against rebels armed withweapons which may have included some that France had earlier sold to Gaddafi. Meanwhile, the opening of Libyan weapons stores also benefited Al Qaida in the Islamic Maghreb in Algeria and Tunisia, including groups responsible for terrorist atrocities in Tunisia. This is not the only extremist group now toting Libyan weapons: solid information has emerged that Al-Shabab in Somalia has been buying ex-Libyan armaments, while Al Jazeera reports that Libyan arms have made their way to Boko Haram in Nigeria. Large quantities of Libyan weaponry also went to Syria in what the New York Times called ’a complex and active multinational effort financed largely by Qatar’. Reports by a UN Panel of Experts also show Libyan arms making its way to Islamic State-affiliated groups in Egypt’s Sinai pensinsula; one such group was responsible for shooting down the Air Egypt plane over Sinai in 2015, killing 224 people, although it is not known if the weapons used came from Libya. From Sinai, arms have been smuggled into Gaza. Militant groups in Chad and Niger have also received Libyan arms. Astonishingly, arms continue to be delivered to Libya by western and other countries, in authorized exceptions to the UN embargo against the country, supposedly to the internationally recognized unity government; but control over the transportation and stockpiling of arms in Libya is so weak, that there is absolutely no guarantee as to into whose hands these arms will ultimately fall. Moreover, while numerous militia have nominally been integrated into the official Libyan armed forces, under the authority of the ministries of the unity government, in practice the govenrment exercises little control over some of them. How arms that are delivered to such groups will actually be used is impossible to know. Paul Holtom, Mark Bromley, Pieter Wezeman and Siemon Wezeman, ‘International Arms Transfers’, in SIPRI Yearbook 2010, p300. “Russia announces Libya arms deal worth $1.8bn”, BBC News, 30 January 2010, accessed 25 May 2017, http://news.bbc.co.uk/2/hi/europe/8489167.stm. EU Annual Reports on Arms Export Controls, 2006-2010. Anthony Cordesman, A tragedy of arms: military and security developments in the Maghreb, Westport, CT: Praeger, 2002, p208. Glen Johnson, “Libyan weapons aid Tuareg rebellion in Mali”, Los Angeles Times, 12 June 2012, accessed 25 May 2017, http://articles.latimes.com/2012/jun/12/world/la-fg-libya-arms-smuggle-20120612. Ian Black, “West overlooked risk of Libya weapons reaching Mali, says expert”, The Guardian, 21 January 2013, accessed 25 May 2017, https://www.theguardian.com/world/2013/jan/21/west-libya-weapons-mali. ; and UN Panel reports. Freedom C. Onuoha, “Porous borders and Boko Haram’s arms smuggling operations in Nigeria”, Al Jazeera Center for Studies, 8 September 2013, accessed 25 May 2017, http://studies.aljazeera.net/en/reports/2013/09/201398104245877469.html. C.J. Chivers, Eric Schmitt, and Mark Mazetti, “In turnabout, Syrian rebels get Libyan weapons”, New York Times, 21 June 2013, accessed 25 May 2017, http://www.nytimes.com/2013/06/22/world/africa/in-a-turnabout-syria-rebels-get-libyan-weapons.html. UN Panel of Experts reports, 2015 and 2016. Based on material from MA Dissertation by Neal Hussein, Tufts Fletcher School, 2017, using information from UN Panels of experts and other sources.